What to make of Burial at Sea? Planned as a two-part episodic expansion for BioShock Infinite, it takes us back to where the series began: The majestic underwater city of Rapture. One part BioShock nostalgia trip and one part extraneous BioShock Infinite epilogue, Burial at Sea's first episode falls unfortunately short of both its predecessors. Heads-up: To write about Burial at Sea, I'm going to have to drop some SPOILERS for the ending of BioShock Infinite. Though really, the new story wouldn't make sense if you hadn't finished the main game, so if you're considering playing it, go finish Infinite first. Burial at Sea, which comes out tomorrow for PC, Xbox 360 and PS3, begins in Booker DeWitt's familiar, darkened office. Naturally, someone's banging on the door. Ah, but this Booker DeWitt exists decades in the future from his past self, far removed from the man who adventured through the floating city of Columbia in 1912. This Booker DeWitt is a 1950s private investigator in the city of Rapture, and this Elizabeth, now older and considerably more va va voom, plays the femme fatale. She hires Booker to help her find a missing girl, and the game is quickly afoot. The three-or-so-hour episode is structured like an extremely condensed version of BioShock Infinite. There's the brightly lit, beautiful introduction, in which you tour a fantastical setting with a barely-hidden dark side. There's the eruption of violence, after which you shloot through a series of colorfully lit rooms while brutally murdering a collection of copy-paste enemies. And there are the story revelations that take place throughout, escalating all the way up to the end. The first act consists of a lavish (and, let's be real here, self-indulgent) tour through a Rapture commercial district. This is Rapture of 1958, a few years before the brutal civil war that left the place in the state of disrepair series fans have come to know and love. This Rapture is shiny and brightly lit; benign sea-life drifts past the towering windows as carefree people mill about. There's jazz music playing, and nary a leaking porthole or blood-soaked surgical table to be found. The first chapter, which has Elizabeth leading Booker around a shopping mall in an attempt to sneak into a party hosted by BioShock 1 scene-stealer Sander Cohen, is easily the most memorable part of Burial at Sea. It plays like exuberant fan service: At first glance, pre-fall Rapture is a lovely looking place. Unfortunately, the more time I spent there the clearer it became that this spit-shined Rapture might've been better left to our imaginations. The city has always had a cartoonish, larger-than-life quality, but in past BioShock games, we only gradually came to understand it by picking through its wreckage. The bleak archeology of the first two games gave Rapture a lost, mythic quality that supported its less-than-believable aspects while underlining its rotten core. The broken bits and pieces the designers left lying around formed the skeleton of what Rapture had been, and our imaginations filled in the rest. The Rapture of Burial at Sea is less convincing than all that, and frequently falls victim to the same Disneyland-like automated quality Infinite did. As you stroll about, taking in the sights, Rapture's glassy-eyed citizens mostly just stand there, moving in a loop and trading snippets of blithe exposition and political chatter. You'll see a Big Daddy—remember those? How cool!—doing Big Daddy-ish things, and an onlooker will remark on how odd those metal monsters are. You'll find eight Little Sisters standing in a row, creepy as ever. You'll see all the same propaganda, hear the same philosophical talk, and detect the same signs of underlying strife and social unease. Witnessed up close in real time, this Rapture feels like a caricature. It's been hastily drawn, and the grandiose antagonists who gave the first two games such substance and character are in short supply. At one point I explored a bookstore that contained only three categories of books: "Self-Optimization," "Empiricism" and "Parasitism." Really? Who on earth would live in this place? I'll grant that it's unlikely that any official recreation of Rapture could live up to the version I've always imagined. (And hey, this does appear to be an alt-universe variant of the city, what with the new technology, vigors and the presence of both Booker and Elizabeth.) All the same, watching this magnificent, storied place come creakily to life left me feeling a bit sad. Oh, I guess that's what Rapture looked like. Huh. Oh, I guess that's what Rapture looked like. Huh. The opening chapter has no combat, and is better for it. At one point, Booker and Elizabeth must find an item that will help them sneak into Cohen's party. It's a classic adventure game setup—Elizabeth winds up distracting shopkeepers while Booker roots around in back rooms looking for the item they need. Unfortunately, the design of the whole thing is paper-thin, and mostly serves to emphasize the fact that BioShock Infinite was designed to be a first-person shooter and little else. There's no way to sneak, no way to chat or deceive, and no inventory to speak of. 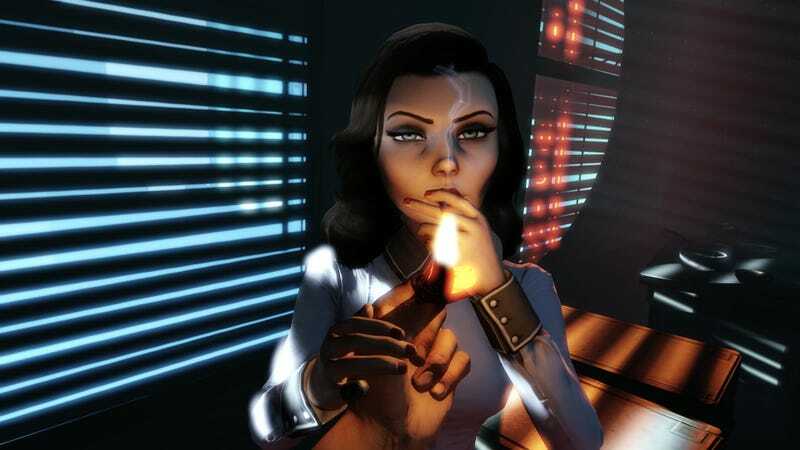 On the surface, the sequence is precisely the kind of thing I wanted more of in Infinite, but while I applaud Burial at Sea's designers for attempting to give us something beyond shoot-loot-shoot-shloot, the opening chapter is mostly a tease for a game that Infinite's trigger-happy underpinnings can't support. Those interesting combat-free moments stand in welcome contrast to the shooting that comes later. After an unceremonious act-break, Booker and Elizabeth find themselves in a separate location that is, conveniently, more or less the wrecked, splicer-infested Rapture of the first two games. Suddenly everyone is an enemy, and the game devolves almost immediately into the sort of shouty, spammy killfests that I so disliked in the main game. I say almost entirely because in this chapter, too, we're given a hint of what might have been. A very (very) light bit of sneaking has been added to the mix, and careful players can crouch and creep up behind unaware splicers before taking them down silently with a single blow. It's another interesting idea that, like the earlier adventure-game elements, the core game can't really support. Most encounters turn into a full-on fracas with a quickness, and the enemies' artificial intelligence is nowhere near smart or consistent enough to make for an enjoyable stealth game. Most of the combat is standard fare for the series: Enter a new room, run around, shoot some guys, use plasmids (which are mostly just recycled vigors from Infinite), run out of ammunition, hope that Elizabeth throws you more ammunition, run out of ammunition again. It's always chaotic and rarely satisfying. It's difficult to evaluate Burial at Sea's story, given that it's the first half of a two-part tale and, more than most first chapters, appears to exist entirely to set up its ending and move us on to the second episode. Developer Irrational Games has already revealed that in episode two, players will control Elizabeth, not Booker. With that in mind, the first episode feels even more tired—tell me again why couldn't we have just played as Elizabeth from the outset? I was expecting Burial at Sea to take advantage of the multiverse of twists that came at the end of Infinite, to embrace that blank metaphysical slate and tell a standalone story. Instead, although Burial takes place in a slightly warped version of BioShock 1's setting, its story relies heavily on the events of Infinite. Burial at Sea's first episode doesn't ask any new questions, nor does it meaningfully expound upon the answers provided at the end of Infinite. I'll hold off final judgement until I've played the second part, though for now I'm not sure about the decision to engage Infinite so directly. Infinite's ending was a double-edged narrative sword—it cut sharply and with admirable boldness, but it also severed its connection to all that preceded it. With an ending like that, what's left to say? Burial at Sea's first episode doesn't ask any new questions, nor does it meaningfully expound upon the answers provided at the end of Infinite. Its attempts to provide fan service wind up dispelling a chunk of Rapture's mystique, and its adherence to the ouroborian twists of Infinite's lore render its story largely meaningless. It doesn't (yet) approach the series' established canon from a different angle, or present us with a surprising new perspective a la BioShock 2's fantastic expansion Minerva's Den. Instead, Burial at Sea's debut mashes Andrew Ryan's BioShock together with Father Comstock's BioShock Infinite and proceeds to bite off more than it can chew. I'm interested to see how it'll all play out, though my expectations for the conclusion have been dampened by the introduction. Still, I'll gladly wait for Elizabeth to take center stage. I hope her star-turn doesn't arrive one act too late. BioShock Infinite Is Insanely, Ridiculously Violent. It&apos;s A Real Shame.